The distinctive look, feel and strength of hand-crafted wood. The combination of beautiful designs, environmentally friendly construction and value have found a new residence: The Verde Collection. The aesthetic richness of hand-made carpentry. The luxury of custom design, with a wealth of choices in pattern, windows and decorative hardware. The strength and durability of wood, but with even greater weather resistance. All at a fraction of the price of conventional wood doors. 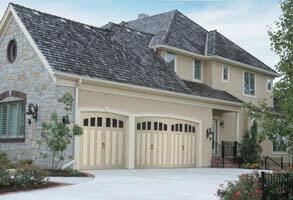 Everything you need to enhance the curb appeal of your home can be found in one naturally beautiful garage door.